DUST storms that have swept across eastern Australia in the past six months have been a graphic reminder of the drought that has afflicted a vast area, but they pale in comparison to the blinding storms that occurred in the middle of last century. 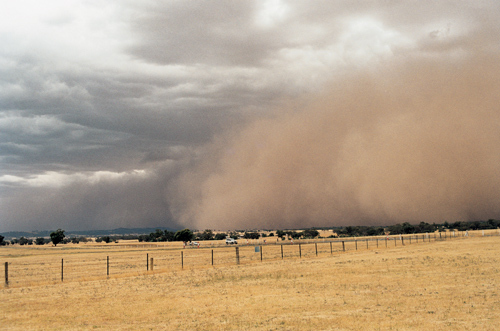 While still an eerie phenomenon, improved land management practices have gone a long way to tempering the scale and impact of modern-day dust storms. NSW Office of Environment and Heritage principal research scientist and DustWatch program leader, John Leys, Gunnedah, said dust storm activity had accelerated in recent months since the last major event in 2009. “In the last 12 months the biggest dust storm was on February 12 and 13 this year. It was almost on the scale of the ‘red dawn’ event in September 2009 which was 2500 kilometres long and we lost about 2.5 million tonnes of soil off the coast. It was the biggest dust storm we have had in the last 20 years,” he said. 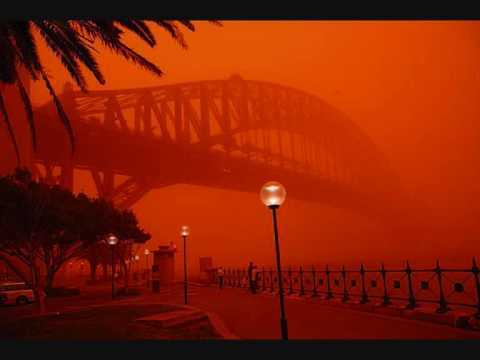 The ‘red dawn’ dust storm in September 2009 was 2500 kilometres long and sent about 2.5 million tonnes of soil off the coast. Dr Leys said the two significant dust storms in the last 12 months were nowhere near as big as those that occurred in the 1940s. “In the 1940s there were multiple dust storms with visibility below 1.0 kilometre. The ‘red dawn’ event (in 2009), visibility was below 1.0 kilometre in Sydney. The one on February 12 and 13 this year was 4.0 kilometres,” he said. Dr Leys said analysis of historical records illustrated the difference in dust storm activity between the 1940s World War II drought and the Millennium drought in the 2000s. “We found the dust levels dropped about six-fold in the ‘noughties’ Millennium drought. There were many, many more dust storms in the 1940s than in the ‘noughties’. The dust storms we are getting now are comparable to what we saw in the Millennium drought,” he said. Dr Leys said for dust storms to occur they needed a combination of wind and low levels of ground cover. 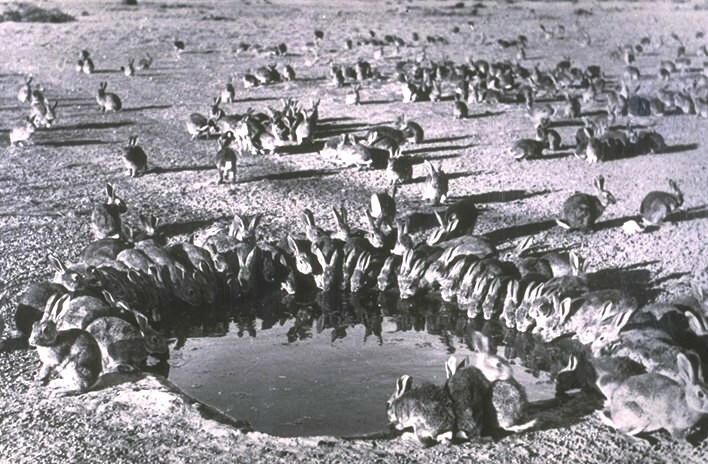 In the 1940s, compared to the present, there was an additional factor that contributed to low levels of ground cover – plagues of rabbits that denuded the landscape. Rabbit plagues were a key contributor to the massive dust storms last century. “The big player in the 1940s was the rabbits. They really knocked the rangelands around, particularly through the Lake Eyre basin right down through South Australia, Victoria and western New South Wales. It really got caned by the rabbits. When the rangelands kick in that is when you get the really big dust storms,” he said. “There weren’t many people on the land because a lot of men went off to the World War which depopulated the rural areas. They didn’t have the resources to do the land management they normally would have. Dr Leys said the underlying causes of eastern Australia’s recent dust storms were essentially the same – deep drought, low ground cover and windy weather – but the fact the dust storms were fewer and less intense now than in the 1940s meant land managers were applying different practices that helped ameliorate the problem. “These days there is a lot more conservation tillage so there is more stubble, there is more crop rotation which tends to mean healthier soils. All that leads to more ground cover,” he said. “But, when you go into a drought, those conservation systems tend to get disrupted. For example, around Gunnedah in northern NSW there was very little winter crop and just about no summer crop. The growing cycle was disrupted and there haven’t been the growth periods like you get in average seasons. Dr Leys said farmers and land managers were now doing things a lot better than they were 30 years ago and there had been a massive increase in landholder understanding of farming systems. 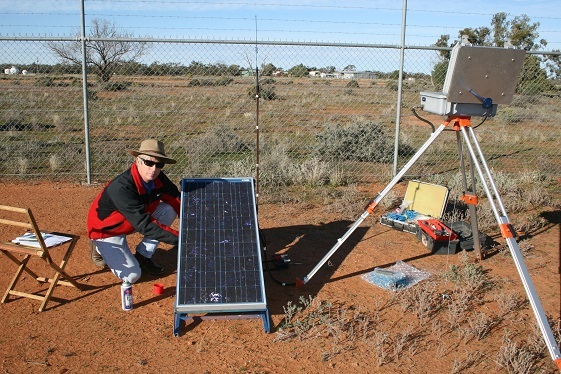 Dr John Leys is leader of the DustWatch program which measures dust activity at 40 monitoring stations, mainly in NSW, but including three sites in Victoria and two in South Australia. He said the way people managed land was one of the key drivers of dust emission – “if it was just the climate, everything would be blowing” – and while techniques had improved, landholders still faced many challenges. “What droughts do is make it increasingly difficult to maintain cover. Your options are reduced and your rotations get disrupted,” he said. “If you grow pulses, they have lower levels of stubble. If you have a failure of a pulse crop you have less stubble, and if you have a failure of a wheat crop and you graze it off you end up with less cover. So, it all depends on what people do. “There has also been a big change in the grazing systems. In the 1940s and 1960s there wasn’t the stock transport that there is now. We move stock around a lot more now. “We have better watering of landscapes. Once there were only a few watering points and all the stock came to them. That doesn’t happen now, so there is much better distribution of stock across the landscape.